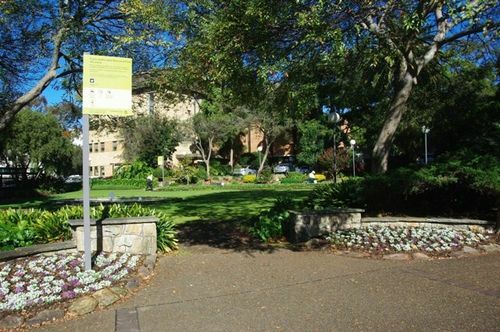 A garden commemorates the men of the Endeavour who entered Botany Bay in 1770. The park is named after Forby Sutherland, a crew member of the Endeavour who died in 1770 and after whom the Shire is named. 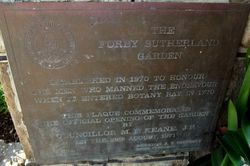 The garden was established in 1970 and officially opened in 1971. Sutherland Shire is known as the `Birthplace of modern Australia`, as Kurnell (now a suburb of the Shire) was the first landing site on the east coast of Australia by James Cook. He went ashore on 29 April, 1770 at a spot now within the Captain Cook`s Landing Place, part of the Botany Bay National Park. For eight days he and his scientists, seamen and marines explored and mapped the area. One of his crew, Forby Sutherland, died there and was buried on the shore. Cook named a nearby headland Point Sutherland after him.